Update: We have a winner -- the Forresto will go head to head with Thrillist at Publican Quality Meats' Burger Night on June 13. May the best double cheeseburger win! Thrillist is about to get into a burger battle, and we need your help. 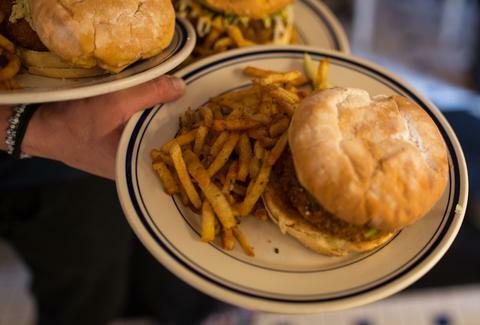 The challenge will take place at Publican Quality Meats’ weekly Burger Night. If you’re not familiar, every Tuesday from May to October, the Fulton Market butcher shop/cafe/market hosts a showdown in which two chefs or teams face off to see who can make the tastiest burger. This year includes PQM Executive Chef Paul Kahan facing Top Chef’s Stephanie Izard, a duel between the casts of Chicago Fire and Chicago Med, 3 Floyds Brewing versus Marz Community Brewing, plus many more local favorites. And on June 13, Thrillist will take on one lucky competitor -- of your choosing. Our entry is the product of Thrillist National Burger Critic Kevin Alexander's painstaking research of 330 different burgers in 30 US cities, borrowing elements from several of his favorites to create the ultimate concoction. It involves two 80/20 chuck patties, a buttered and griddled roll (Martin potato or classic thin white), crispy shoestring potatoes, a spicy pickle and pickled red onion mix, secret sauce, peppery caramelized onions, and a good helping of American cheese. “This particular sandwich was inspired by a small kabob stand in the Tel Aviv Carmel Market. It’s an incredible place and one of the busiest tourist destinations, so I'd be surprised if even 1% of people know they're walking past a local gem. “The burger is, obviously, ground lamb, with salt, pepper, garlic, parsley, herbs, and the usual mix of Mediterranean spices. Toppings are crucial here: hummus, of course, ideally housemade (the famous recipe from Dizengoff is a good and easy one. Then Israeli salad: square diced tomato, cucumber, and onion with salt, pepper, and lemon juice. And then a few slices of pickle -- a Moroccan schoog for those who like it spicy -- and lastly some tahini. “In terms of the way I eat, I've always been about the classics. I never use recipes. I buy the best ingredients possible and let the food itself do the talking. “I start with a classic potato bun, and it needs to be skinny because meat-to-bun ratio is key (the potato bun PQM uses on their classic burger is too thick for me). It also needs to be warm. For the patties, I use PQM’s chuck, season them with Lawry’s and black pepper, and grill them until they’re medium rare -- that’s a major factor! Then I put two different cheeses on the patties, a white and a yellow, like a fancy Swiss or Gruyere and American. I top it with butter pickle chips, grilled yellow onions, ketchup, and a mayo-based aioli with garlic or truffle. The final ingredient? Crispy bacon. “My Salmon Patty Burger was inspired by salmon patties my mom used to make. This is my modern approach to an old-school, simple dish. "The burger is topped with homemade fried potato chips and tomato jam, served with butter lettuce on an onion roll. For the patty, I use either 24oz of baked salmon or Wild Planet canned Wild Alaskan Sockeye Salmon, one egg, about a cup of panko bread crumbs, Maille Old Style Whole Grain Mustard Seed to taste, salt, pepper, half a yellow onion, diced, and 1/4 cup mayo. For the tomato jam, I use five diced large roma tomatoes, butter, caramelized yellow onion, garlic cloves, cider apple vinegar, lemon and lime juices, Cholula, salt, pepper, and paprika. Which custom recipe should take on the Thrillist Burger?